I missed this in Thursday's Herald. It is the last letter & I had come to expect them not to publish. It is published exactly as I sent it in. Britain has a new space agency. The government have provided £12 million to build a new HQ in Swindon. 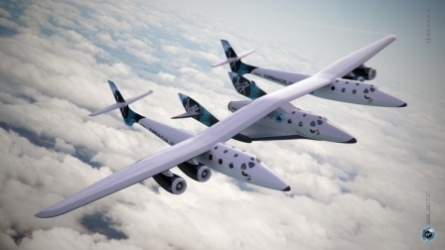 This is twice the Ansari X-prize for the first private launch into space which started Virgin Galactic. Unfortunately the government aren't actually providing any more money for space itself. Virtually all our present money goes to Europe for a space programme which, with 15 times the budget of Russia, clearly wastes rather more than 14 15ths. It is not that the government doesn't know how important space development is. At £6 bn a year it is one of our very few successful & growing industries (9% a year). If government would put the money spent on Europe into X-Prizes like the one mentioned Britain could easily be the world leader in this industry. Nobody in government even denies this would work (in any case it would cost nothing if it didn't, such being the difference between prizes & most government spending. We are on the ground floor, literally, of an industry that is transforming the human race & the total role of our government is to carry out a Mori poll showing the public understand how important this is & as a result announce a token new "agency" keep funnelling money to the usual bureaucrats. 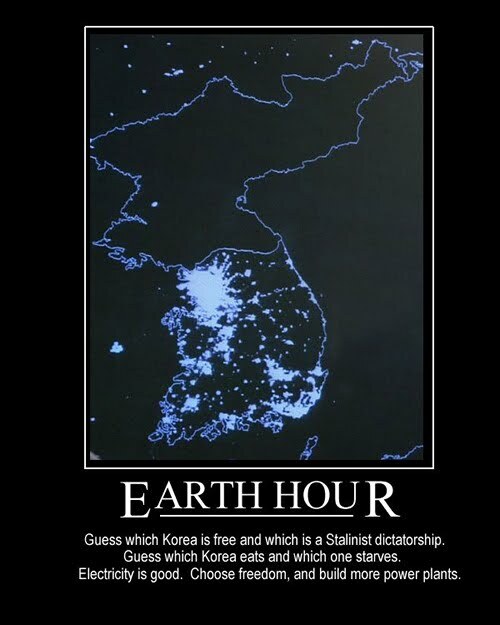 Via Mr Euginides & Dizzy together with a plea that instead of celebrating Earth Hour (last year they called it Earth Day) by switching off all your lights (8.30pm on Saturday 27th March) we should celebrate Human Achievement Hour by keeping them on. My suspicion is that most people will do the latter & only the most useless & pretentious parts of government will do the former which seems appropriate. eg Zimbabwean children will hold a candlelit picnic & the WWF fakecharity are pushing it. This orbital picture shows, in a way 1,000 words couldn't do, what is wrong with pure socialism & indeed Luddite "environmentalism". One may argue correctly that less pure socialism/Luddism we have in Britain is less destructive but that is an argument only that it is less horrible not that it is in any way good. There is a close relationship between electricity use & GNP with the developed world averaging just under $4 of GNP per kWh, China doing $2.45, Britain $6.3 & those significantly above being undeveloped, artificially increasing wealth by having oil, or so failing that electricity & the rule of law doesn't go beyond the capital city, or all 3. There are a noisy minority who would do this in Britain if they could, though they have less organising ability than Kim. This extremely silly letter published in the Morning Star inviting us all to prove our socialist purity by supporting North Korea in the World cup. To be fair it was followed by a reply saying otherwise but to continue being fair that was followed by a further reply saying that "many reactionaries would take comfort" from the 1st reply. My previous poll on the desired size of government showed that while there is a normal curve centering around about 17% of GNP being government spending there was a another small bump at +90% who clearly can never be even close to placated by anything acceptable to the overwhelming bulk of us (& of whom I am ungenerous enough to suspect none live out of anything but the public purse). Placating the Luddite parasites need not be done & by doing so we have just been paying Danegeld, since, as my post yesterday showed, the parasites will tell any lie to build a poorer nation if it will pay them. Last night I attended the Royal Philosophical Society of Glasgow lecture in which Professor Anne Glover, the Chief Science Advisor & also on the committee of NERC told us all about how dreadfully catastrophic global warming was. I am afraid I was not impressed. The lecture started by saying how important it is that we stick to the evidence. The sceptics have even done some good by making people focus on the evidence & that was what she intended. Her evidence for warming turns out not to be that catastrophic warming is actually taking place but that human caused CO2 emissions are rising dramatically & that this means warming must happen. She used this graph foreshortened for the period 1850-2000 & with the perpendicular graph in units of 1 - 25 but without saying in what units This caused me to dump the question I intended to ask, which was about the fact that virtually the entire "scientific consensus" is among the government paid. Other evidence, from the Antarctic, being that the CO2 in air is higher than it has been in millenia (this being from ice cores & is questioned since it is possible the CO2 leaks more than Oxygen). No mention of the fact that ice at both poles is increasing & that in the Antarctic it never stopped doing so. She acknowledged that sea level in Scotland is actually falling ie that the land is bouncing back from the last ice age faster than any sea level rise but that in Bangladesh the rise would matter. During a previous lecture to a junior school one of the pupils had said they didn't care about Bangladesh but that she had pointed out to him that in that case the people of Bangladesh would want to come here - mass population movement being another of those things global warming is responsible for. This was followed by an acknowledgement of the value of having sceptics around because "there is no such thing as truth or certainty" in science. Then the familiar graph showing how temperature, or at least measured temperature, has risen & also that it has fallen over recent years, though that was ignored & described as "we're experiencing climate change now." Then there was a graph showing the probabilities of various levels of temperature increase - apparently we have an 85% chance of 2 degree warming. However apart from saying the graph proved the chances she didn't say how this relative certainty had been achieved. This was followed by another showing what catastrophic effects such increases will have, particularly on food production - though no mention of the increased growth caused by more CO2 & the only mention of all the Canadian & Russia tundra that would become fertile was to say it would be worse at the equator. To be fair to Scotland she did say that warmer weather here might not be bad particularly with the "increase in day length in Scotland" - I kid you not. Presumably some heretofore unknown effect of global warming is that it will tilt the Earth's axis to lengthen our day. Another effect of warming is an increase in extreme weather such as parasites moving. An example is the midge causing Bluetonge disease in cattle. This previously could only survive in Africa but has now settled in Scotland entirely because of global warming. She then lectured us on all the non-carbon energy systems we will have to adopt - except without mentioning nuclear. This must be achieved by the spontaneous enthusiasm of the populace. The role of government is "legislation", "information", "eduction" & "leadership". Then I learned something I had not appreciated. I have previously written on how the government's decision to reduce CO2 by 42% by 2020, means a reduction in electricity production & thus national wealth of 50%. One of her slides showed that Holyrood has also decided that we must get rid of 100% of CO2 production in making electricity by 2030. That would leave us with about 10% from existing hydro & probably about another 5% from windmills etc. The former requires a 7% annual recession for 10 year - the latter 9% annual decline for 20 years. Perhaps I underestimated when I said the former decision, made unanimously by all parties & MSPs meant they are all clinically insane. Having slid by that bombshell she assured us that doing all this will only cost us 1% of GNP, because Stern said so, compared to paying 8% of GNP to bail out the banks. Apart from anything else that piece of sleight of hand omits that 1% a year is not the same as 1% in total. She finished by saying how she had visited the carbon storage project & how "my jaw dropped in amazement" at the technology. The gentleman next to me quietly said "this is Scotland's chief science advisor!". Audience Questions. The first was about Professor Lovelock quoted as saying that it was all to late anyway. She disagreed. Then I got mine. First I said I had to point out that Professor Lovelock, having seen the fraud going on, had evidently changed his mind & said that only the sceptics had kept the debate sane. My question was about he CO2 graph - firstly that the period of sharpest rise, roughly 1940 - 75 was, on the other graph she had shown, a period of reduced temperature. Secondly that she ought to be aware that manmade emissions accounted for only 3% of the total & that had total CO2 production been shown the graph would have been of a 3% rise rather than a 2,500% rise. She replied saying how much she valued the contribution of sceptics it is just that they "don't provide evidence" for their doubts. Really she did. Then that what mattered is that the entire system is so well balanced & there is no countervailing way of reducing CO2 so even a tiny increase is disastrous. Since plant growth increases with more CO2 that most certainly is a method of taking more out but I contented myself by saying that with CO2 being 300 ppm of the atmosphere & mankind producing only 3% of it that is 9 parts in a million which is not much to cause catastrophe. She replied by saying that it was so finely balanced that just a 2 - 3C rise would be enough to melt Greenland. I wished to reply that since we have had a 4C rise during the climate optimum of 9,000 - 5,000 BC but Greenland has been unmelted for at least 650,000 years that could not be correct but was told, quite properly since it is a lecture not a debate, that my time was up. She was also asked a couple of questions about nuclear power. Particularly had she, in her role of chief science advisor, advised the government that it was impossible to keep the lights on without nuclear? The questioner, correctly in my opinion, implied that it was her absolute duty to give good such good advice on the issue. She ducked a direct answer saying that some less chiefly advisers knew more about nuclear but agreed that "nobody ever said wind can provide baseload - baseload is coal, gas & oil" (though presumably not in 2030). She also rather praised recession as a way of cutting CO2 saying of the graph shown "if I had extended the graph it would have shown another dip". While this lecture may do for frightening younger schoolchildren the Royal Phil is a society with a lot of very qualified members, moreso than me & I think are entitled to expect something more serious. I attended your lecture at the Royal Phil last night & have written it up for my blog. I think it fair & accurate but hope you will let me know if you think otherwise or if there is any assertion in it you wish to alter. I was interested to see that you are a senior person on the £400 million a year NERC. The boss of NERC did once, through the columns of the Guardian, challenge sceptics to a public &/or online debate but when the challenge was accepted, for some unknown reason, went silent. Would you be willing to take part in a public debate on warming? If you are going to be busy all this year do you know of any other representative of that government information propagation organisation who would? Last year I put in a submission to the UK Space Review saying how we could become the world leaders in space exploitation, without spending any new money but simply by taking what is currently given to ESA & putting it into an X-Prize Foundation. They didn't actually have the courtesy to let those who contributed to the review when the report came out & in this case that is understandable. recommendations of previous work, there has been a consistent failure of implementation"; "We envisage a Cabinet Office led process to formulate and agree a policy across Departments at Ministerial level". And that's pretty much it. It is agreed that space development is a fast growing (9% annually) part of the economy apparently worth £6 bn at the moment & easily able to rise to £40 bn. Currently the government nominally put in £268 million to ESA however that should not be taken at face value. NASA gets $18 bn but now has actually less spacegoing capability than Russia spending $0.9 bn so at least 95% of their money goes on the "job creation programme for the southern states" & others. ESA's record, with half the money NASA has available isn't 1/4 as good - they haven't yet put a living being in space. At best then they can be only 2.5% efficient so that means the total actual space budget for Britain is £6.6 million. One thousandth of what it creates for the economy, 1/6,000th of what we are nominally aiming for & 1/60th of what we spend through NERC on about 25 environmental reports on global warming, bumblebees etc annually. So the proposal is, apart from a very useful proposed change to the Outer Space Law stopping government stop space tourism everything else is paper shuffling & "raising awareness" of how important government is to the process - the politicians having noticed the public is aware of the importance of space but doesn't appreciate how much our lords & masters are doing. Yesterday we got the public announcement that instead of our British national space centre we would have a British Space Agency. And there will be more money - £12 million to build the HQ which will be a "central hub for British space activity", in Swindon. Not so much a jobs creation programme for the southern states then as for Wales. Incidentally £12 million is almost exactly twice what was put into the Ansari X-Prize for the first free enterprise space ship. It is just over half what the Scottish government are putting into an X-Prize for a commercial sea turbine. Everything they say about this being a major "prize" an enormous opportunity, a major role in the future of our economy is true. Indeed greatly understated - if space industry grows not at the 10% they aim for but the 17.6% the US is achieving it will be not £40 bn annually but £300 bn, if we improve on that by another 7% it will be £2.4 trillion by 2030, comfortably larger than the entire UK economy now. Yet for our government it is nothing more than an excuse to use a relatively popular issue to slide money the British & European bureaucrat's putting, at best, a token £6.6 million frontage that might actually help develop space. This is not ignorance of the opportunity - nobody in the bureaucracy has disputed, in any way, that simply spending the money we are already wasting, on actually encouraging industry through X-Prizes, we could achieve the US growth rate at the very least. Nobody can dispute it but the bureaucracy doesn't exist to carry out its nominal function, it exists only to reward government employees & their friends. However the figures remain public, so does the proposal & it can be done by any government, or even probably any junior minister, who actually wants to achieve something. And Virgin Galactic have test flown their spaceplane. Previously I reported how, on asking 10s of thousands of people worldwide to name as many as 2 scientists who said catastrophic warming was happening & who aren't ultimately paid by government. I got answers from 2 people. One originated with the climate correspondent of the Independent who named only Professor James Lovelock & the other was an online comment on a South African site naming only Professor James Lovelock. 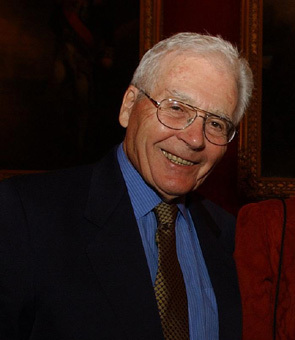 the other night at the Royal Society, when a small gathering of luminaries turned up to hear that extraordinary nonagenarian, the scientist James Lovelock. To my surprise, he immediately professed his admiration for the climate-change sceptics. How should we be spending our money to prevent possible disaster? In Britain, says Lovelock, we need sea walls and more nuclear power. Heretical stuff, when you consider the vast amount that Europe plans to spend on wind turbines. Nothing he said that I would seriously disagree with. That the Times considers it worth pointing out that this scientist "places great emphasis on proof" shows how far our media have gone. Predictions should be treated seriously & tested both mathematically & against real world measurements - which is what the sceptics have done, against the wishes of the alarmists. Jerry Pournelle, for whom my admiration must be obvious, has regularly said that he is worried about us running an open ended experiment of dumping billions of tons of CO2 in the atmosphere, it is simply that we should actually measure the effects rather than jumping into scare stories & it is equally true when Lovelock says it. I have always said that I regard their position on nuclear power as a touchstone of the integrity of any "environmentalist" supporting the possibility (let alone alleged 95% certainty) of catastrophic warming. Nuclear is the only way of producing reliable continuous power in quantity without CO2. If you truly believe CO2 is causing a catastrophe for civilisation then you simply cannot fail to enthusiastically support it. Lovelock has been almost alone among environmentalists in consistently doing so - the only other one I can think of is Bishop Hugh Montefiore who was drummed out of FoE for saying it. My guess would be that CO2 warming will be less than 1-2 degrees but we could certainly live with that - it puts us up with the Medieval Warming & probably still less than the Garden of Eden like Climate Optimum of 5,000-9,0000 BC. I am also more sanguine even than Pournelle because I believe any geo-engineering problem can be solved once we have space industrialisation, which we can have any time we decide on it, because "we would build a Lunar colony on weekends and third shifts - And solving global warming, if it actually ever turns out to be a problem, by building tinfoil parasols on bank holidays.". I have previously mentioned Lovelock's Gaia theory, that the Earth's biosystems have positive feedback that help survival. Though I incline to an alternate idea that we live in a multiverse so the undeniable statistical improbability of us being here is the result of universes where things went otherwise & the Earth is not habitable not having observers to see. Whichever is correct that statistical improbability exists & it cannot be the conventional "nothing out of the ordinary, move along" one. This is a thread I will update regularly. My other articles on this are here. If anyone has links to further evidence of hormesis (or indeed of the opposing LNT theory) I would be obliged if you would let me know. The present position among supporters of the official scare story is "epidemiological data relating to low levels of exposure are compatible with a range of curves describing the variation of the underlying risk with the level of exposure, including a curve that is steeper than the LNT relationship (a ‘supralinear’ curve), no risk below a certain level (‘threshold’), or even a protective effect (‘radiation hormesis’)" so they went for LNT. This, subject to being repeatable, appears to be indisputable proof that LNT is false. Not necessarily that hormesis is correct but certainly consistent with it. As I write here. 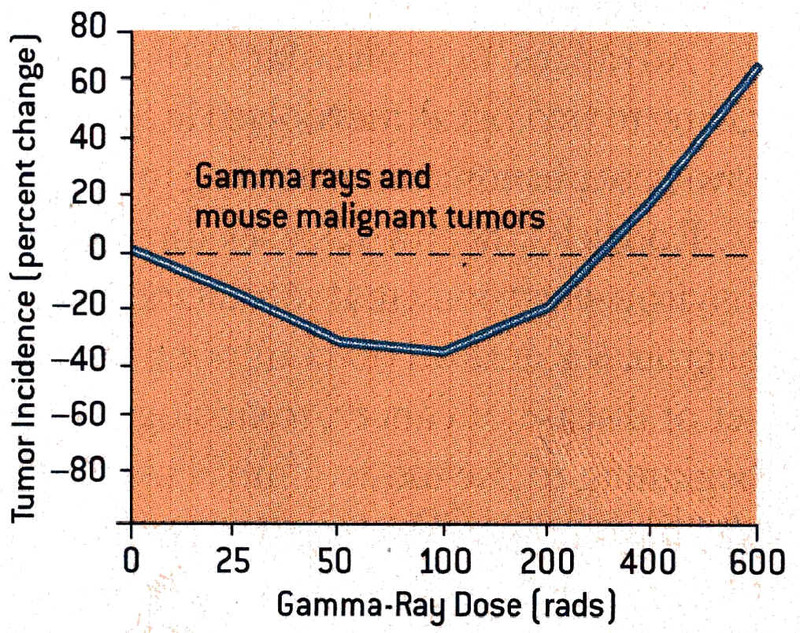 Recent evidence including a study of health of airline crew who are exposed to calculable amouints of radiation. Scientists actively looking for confirmation of LNT instead found cancers "generally lower than in the comparison population" which is consistent only with hormesis. I have been sent a list dealt with here. It consists of arguments from authority (the powers that be say it so it must be true) which are, by definition, intellectually valueless and even more wrong scientifically and some very careful selection of random fluctuations which would be unworthy even of publication in looking for evidence in real science let alone being accepted as proof. Nobody anywhere else in the world appears to have been able to produce anything as good. This article claims 4.98% [standard error (SE) = 1.5] per 10-mSv cumulative dose received after age 45 under a 10-year lag, and 7.31% (SE = 2.2) per 10-mSv cumulative dose received after age 45 under a 20-year lag at Oak Ridge. It does not appear to have been replicated anywhere else and is more consistent with a data dredge fitting up random data (would the same effect have been there if it was workers after age 40 or 50 or a 3 year or 15 year interval) in a data dredge. I celebrate here and here and on ThinkScotland here. In a world where decisions were made primarily on the basis of fact thjat would be an end of it. Tomorrow morning 95% of nuclear regulations would be ended and we would start pouring concrete for hundreds of new reactors. In this world the news has been reported by Forbes and ThinkScotland and that's about it and doubtless, just as the anti-GM & anti-shale gas campaigns have wotked without ever having to produce any evidence of harm or even a credible means by which harm can be done this campaign will keep running. But from now on it is running on empty.